Abhinav’s parents say he ‘eats, sleeps and breathes’ dance. While the audience was rooting for the competitors of Delhi’s Date With Democracy, a programme organised by the Delhi government’s Department of Art, Culture and Languages, the one who drew the maximum cheers was a young man in pink T-shirt and blue jeans. 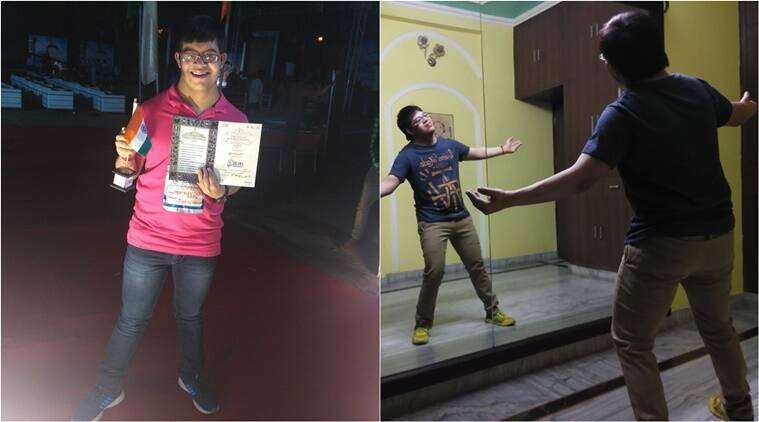 Meet Abhinav Chaudhary, an 18-year-old who was diagnosed with Down Syndrome at the age of one and also suffers from poor vision. He won the second prize in the dancing category at the cluster-level of the competition on April 8. The contest was first held in 280 wards of Delhi. The ward-level winners then had to compete at the Assembly level. The finalists from 70 Assemblies then reached the cluster-level contest, which was simultaneously held at five different venues all over Delhi. Abhinav won from Mahavir Vatika in Mayur Vihar Phase II. A Class 10 student of Well Being Special School in Indirapuram, Abhinav’s parents say he “eats, sleeps and breathes” dance. His mother Neerja says Abhinav picks up his steps from television and online videos and enjoys it the most when she accompanies him during his practice sessions. His father, Brijesh Kumar, a civil engineer, has set up a studio at their Ghaziabad home, complete with music systems and gigantic mirrors. “We discovered his love for dance at a very early age. He used to start dancing whenever he heard any song on TV,” said Kumar. Apart from parents, Abhinav dotes on his 10-year-old sister Amulya, for whom he “saves all the chocolates” he gets from school. Abhinav has performed in over 100 shows for which he has been to several places, including Delhi, Noida, Moradabad and IIT-Roorkee and had also taken part in the Bihar Divas celebrations in 2017. He also qualified to the TV round of popular reality show Dance India Dance in Mumbai and is a regular at the Shiamak Davar Dance Academy.